Berezin Stereo now offers a broad range of services for the marketing professionals to promote their products with depth. These include stereo slide viewers, 3D image production, production and pre-press work. Some examples of work which we have done. Provided customized viewers and images for Imax/Warner Brothers production of Polar Express. These were used to promote the 3D movie to film reviewers. Worked with Xoma (a pharmaceutical company) to produce a 3D in-house promotion for their "name that molecule" contest. The promotion producing a hard plastic 3D print viewer for a stereoview of a 3d molecule. Provided an Orchid magazine with a 3D promotion for their readers which included a viewer and a series of images. 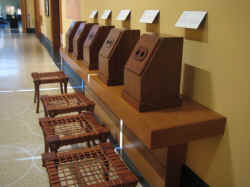 Worked with several museums with providing member premiums which showed off the museums large stereo image collections. Produced 3D conversions of flat images of marine life for Sea World. Produced 3D conversions of flat images for a Chick-fil-A 3d childrens menu. We have worked with many museums to help them show off their stereoview collections. These have included the Getty Museum, the Antique Boat Museum, Brooklyn Museum of Art, Farmington Museum, Billings Farm, Staten Island Historical Society, Shasta State Historic Park and the Philadelphia Museum of Art. We have access to a large 3D stock photography library and also have the ability to shoot 3D photography of any type. We have a large variety of shooting equipment available in 35mm, Digital and Video. In those cases where no 3D images are available we can convert an existing 2D image into 3D. Prices start at ~$220 per image and vary depending on the complexity of the starting image. We can also layer titles and images on 2D images to give them more depth. More information. For more information on these and other services please contact us.